Tired of eating the same old chicken dinner? 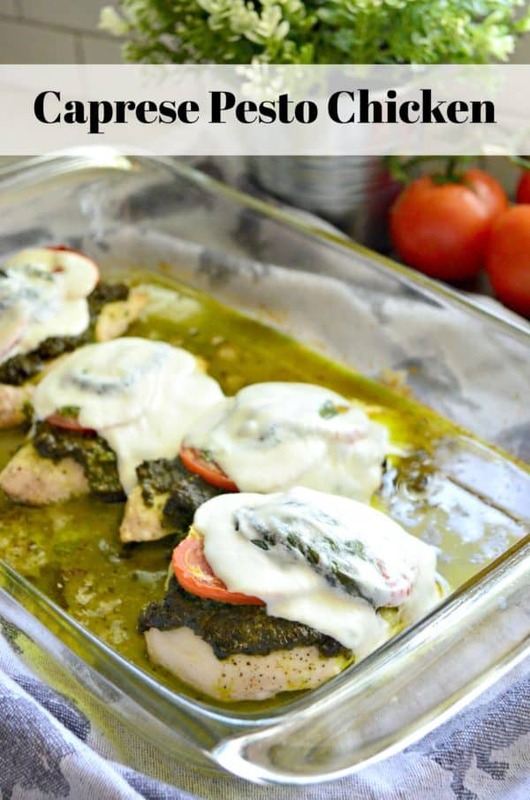 Fresh vibrant basil pesto elevated chicken to a whole new level with my easy recipe for Caprese Pesto Chicken. Right now my basil is out of control. I’ve been making batches of pesto almost weekly. I use some and freeze the rest, so I can enjoy it when I don’t have an abundance of basil at my finger tips. We love the traditional pesto pasta, but what I’ve been making lately that everyone loves in my home is Caprese Pesto Chicken. It’s easy to put together and bakes quickly. You can make the basil pesto fresh before you make the chicken or defrost pesto to make the prep time that much quicker. The day that I decided to finally photograph this recipe I used thawed pesto. Pesto does tend to go from bright vibrant green to a darker color when you freeze it or even store it for a day or two. Air is it’s enemy when it comes to color. Making this recipe is so easy and best of all–it’s quite the show stopper. I’ve even entertained with this recipe this summer and my in-laws loved the chicken, and most importantly, my kids devour this chicken. We tell my 4 year old, Ryder, that this is hulk chicken. He loves it and eats it right up. I’ve learned that if I can associate some part of dinner with something he likes then he will eat it without any questions. This is a simple recipe but oh-so-good. If you don’t have the pesto and need to first season my skinless boneless chicken breast with salt and pepper. Then I slather the fresh homemade basil pesto on top of chicken breast. Then layer it with slices of tomatoes and top with fresh mozzarella. In the oven it goes and bakes to perfection. I put the cheese on at the beginning and by the time the chicken is done the cheese is golden and bubbly. If your looking for a way to use up all the basil you’ve been growing or simply love pesto and looking for a new quick chicken dinner idea. 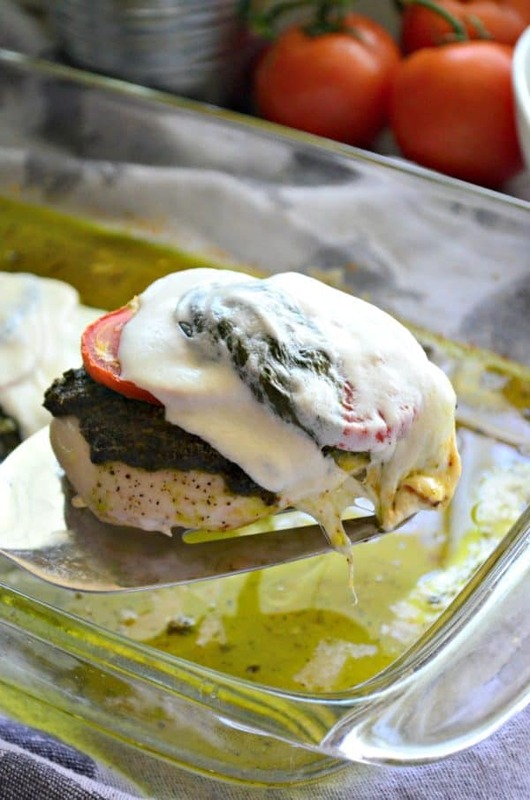 I think you definitely need to try my recipe for Caprese Pesto Chicken. Drizzle a 9x11 glass pan with one tablespoon olive oil. Rinse and pat dry the chicken breast. Season generously with salt and black pepper. Place the chicken breast in the glass pan. 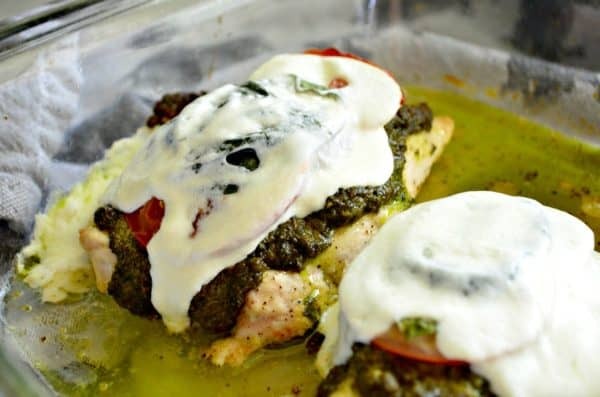 Slather each chicken breast with about two tablespoons basil pesto (only on the top side). Repeat until all the pesto is used. Add 2-3 sliced tomatoes on top, sprinkle additional salt and pepper on top of the tomatoes. Top with a slice of fresh mozzarella cheese. Then drizzle with the remaining one tablespoon of olive oil. Bake for 25 minutes or until the internal temperature of the chicken breast is 165 degrees Fahrenheit. Remove from the oven, divide among plates and enjoy.